Sixteenth volume in one of the generally most satisfying annual anthologies of contemporary fiction. 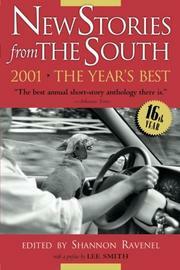 In a conversational preface about her sushi bar in North Carolina, a paradigm for the evolving region, novelist Lee Smith provides this year’s answer to the anthology’s knotty implied question, “What is the South, anyway?” “We Southerners love a story,” she writes. “This is the main thing that has not changed . . . [and] that will never change.” The contributors this time around would probably agree: most are younger writers just putting a novel or two behind them, and each has a significant, connection to the region. Many of the stories, admittedly, are sluggish and perform a single narrative trick, like “Saturday Morning Car Wash Club,” about how one boy fools a bunch of bullies to get his car washed (“no big whoop,” James Ellis Thomas aptly observes in the author’s note). But there are a handful that shine. Christie Hodgen’s piercingly sad “The Hero of Loneliness” tells of an adopted boy’s struggle with his inner demons, which prompt a lifetime of wandering. George Singleton offers “Public Relations,” a mirthful portrait of a p.r. shark who destroys companies for a living and attempts to keep his private life whole. Edith Pearlman’s “Skin Deep” adores two unrelated characters who pursue their single, celibate lives with a sense of satisfying completeness. Nicola Mason’s “The Whimsied World” consists of five dreamlike “miniatures,” loopy but engaging fables about everyday objects. Immediately recognizable writers include Madison Smartt Bell, whose unaffected (if not artless) narratives are buoyed only by his fluent, gentle style; and John Barth, who tells us that the default of his computer’s date-function inspired this story about time, aging, and memory. No anthology satisfies all readers, but Ravenel’s editorial eye is as sharp as ever, appealing to the center of the heart rather than the middle of the brow.